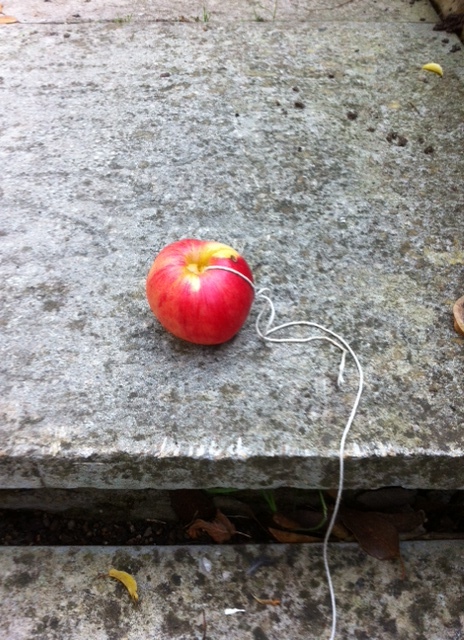 Nearby Team Pugh HQ there are 4 bountiful apple trees, which are jam packed full of lovely cooking apples. We have collected up a few bags full and stewed some for some lovely apple sauce, some crumbles and an amazing Baked Alaska! But when we were last out picking we noticed just how many there were on the floor, either with a few worm holes or the odd rotten patch, which were too good to see waste away in to the soil. 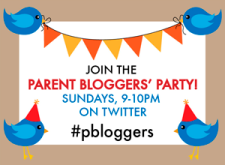 So…………..Ian hatched a cunning plan to make use of them! The chickens love pecking at things, whether it is food, a mirror, fingers or each other, and love nothing more than pecking lettuces hung by their roots in their hutch, so………….we present the Chickentertainment Centre! 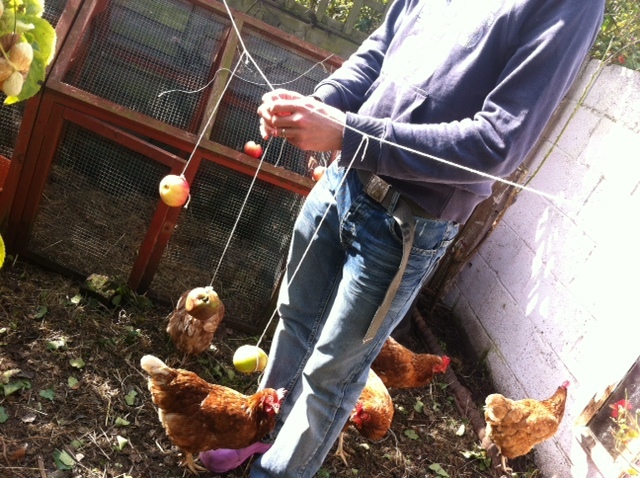 Very easy to make, it is basically one bit of string strung across the chickens’ pen, with downward strings holding apples for the chickens to peck merrily at. 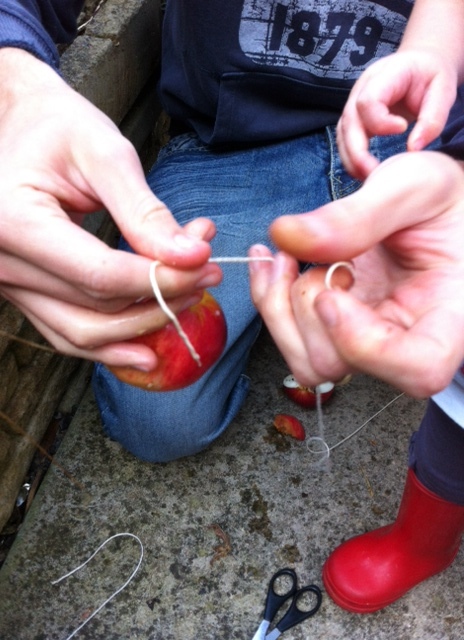 We are sure there is an easier and safer way to put the apples onto strings, but Ian went for the ‘ram a pair of scissors through the core and poke the string through’ approach. 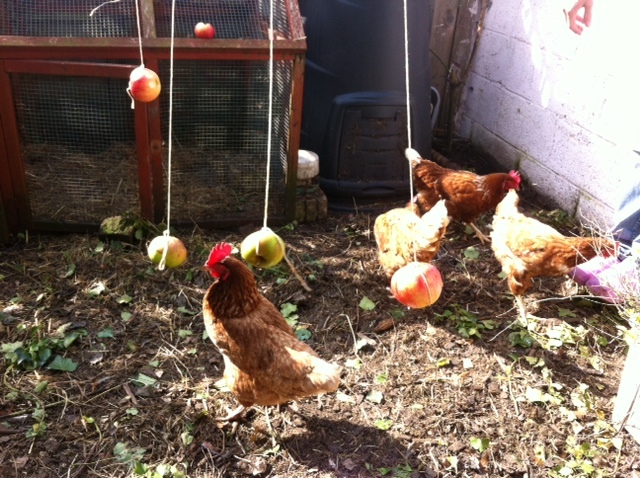 The result is 5 very happy chickens, and a happy Lizzie who is enjoying watching the chickens peck at the floating apples, a happy Ian that the chicken’s are getting some excellent free food and a happy Becksie, as the construction kept Ian quiet for half an hour or so!